The verb 싫다 means to hate or dislike and we can use it to express what we hate to do. In English, we can use both gerund (verb-ing) and infinitive (to verb) with it. For example, we either say I hate to see him or I hate seeing him. There is a bit difference in nuance though. I hate to see him sounds futuristic while I hate seeing him is an everyday occurrence. In Korean, there are also two ways to say that. 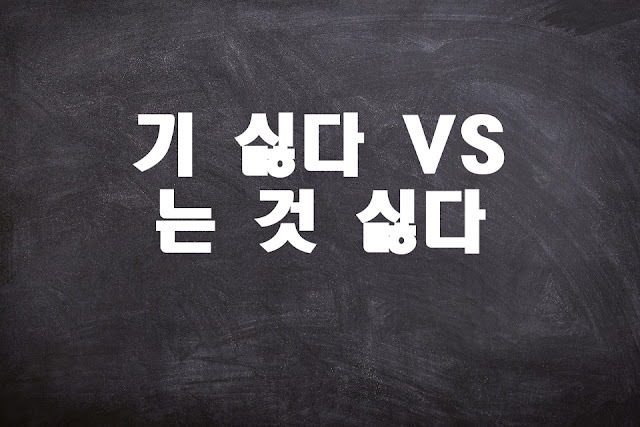 One is 기 싫다 and the other is 는 것 싫다 (often contracted into 는 거 싫다). Both are attached to the stem of any verb. Just like in English, there is a difference in nuance. 기 싫다 somewhat carries a futuristic nuance just like hate to do while 는 것 싫다 somewhat refers to an action that you hate generally, all the time. I hate worrying about useless things. I hate putting it in my mouth. I don’t want to live there. I don’t like sleeping on the floor.